Kerry Flyer are running a competition over on our Facebook page. 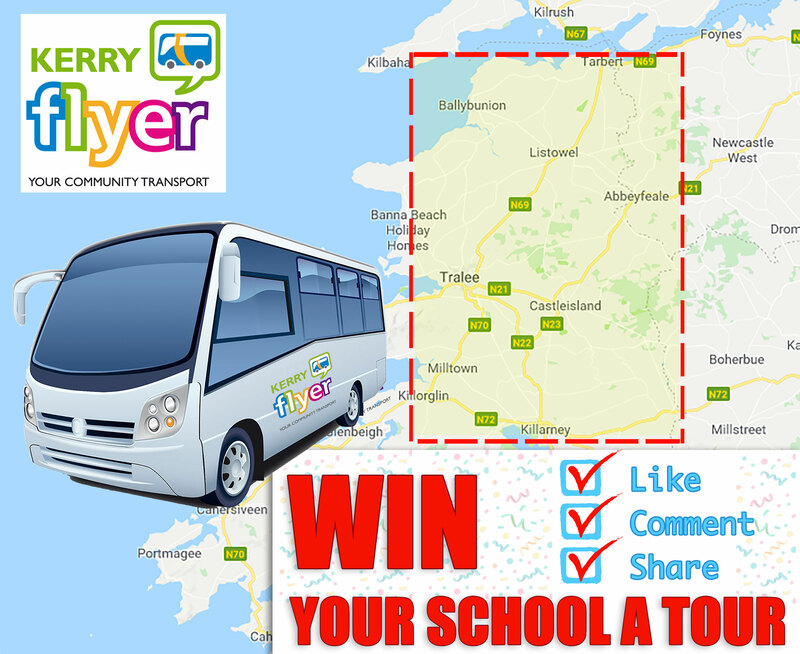 We are giving one lucky school in the East and North Kerry area (as shown on the map accompanied) the chance to win a free coach trip for their school tour in June 2019. The competition will run until the 19th of April. We will then pick a winner at random on the 20th,announce them and contact the lucky school in the days that follow. The promoter is Kerry Flyer C.L.G. Ltd, whose registered office is at The Crageens, Castleisland, Co. Kerry. The competition is open to schools in the East and North of Kerry, as shown on the map accompanied with the competition details. Closing date for entry will be April 19th, 2019. After this date no further entries to the competition will be permitted. The rules of the competition and how to enter are as follows: 1) you have to LIKE the competition post 2) Share the post 3) comment (preferably tagging) the school you think would benefit most from this prize. The prize is as follows:one free coach trip for a school to be used for their school tour in the month of June. The prize is as stated and no cash or other alternatives will be offered. The prizes are not transferable. Prize must be redeemed in June 2019 only. Maximum number of passengers is 57. Prizes are subject to availability and we reserve the right to substitute any prize with another of equivalent value without giving notice. Winners will be chosen at random by software, from all entries received and verified by a member of staff. The winner’s name will be available in the days following the closing date.